Syrah- and Grenache-based wines rank among the Golden State’s most exciting new releases. The inside story of the wines, and the rising generation of vintners who make them. California Rhône: A free chart offers an alphabetical list of all the California Rhône wines reviewed for the tasting report in this issue. Chile: A free chart offers an alphabetical list of all the wines from Chile reviewed for the tasting report in this issue. WineSpectator.com: BONUS VIDEO: Join Saxum winemaker Justin Smith in his Paso Robles vineyards as he discusses their evolution, his picking decisions and what he thinks of the 2007 James Berry Vineyard bottling that was named the 2010 Wine of the Year. WineSpectator.com: More than 340 wines were reviewed for this report. A free alphabetical list is available. WineSpectator.com members can access complete reviews for all the wines tasted using the online Wine Ratings Search. WineSpectator.com: More than 440 wines were reviewed for this report. A free alphabetical list is available. WineSpectator.com members can access complete reviews for all the wines tasted using the online Wine Ratings Search. WineSpectator.com: Members can reference our full archives of Jack Bettridge’s columns, and other articles on spirits. WineSpectator.com: Build your cellar through smart bidding. Use our online Auction Price Database to track the performance of more than 12,000 collectible wines, and check the results at the latest major sales with our Auction Highlights. WineSpectator.com: In his latest blogs, James Laube finds the incidence of corked wines on the decline, discusses winemaker Andy Erickson's departure from Screaming Eagle, explains why vintners usually love the wine they're with. Join the conversation with other members. WINE AND FOOD MATCHMAKING In our new "8 & $20" series, you'll learn how eight ingredients and an under-$20 bottle of wine can come together for a restaurant-quality meal. Check back often for easy, tasty recipes. 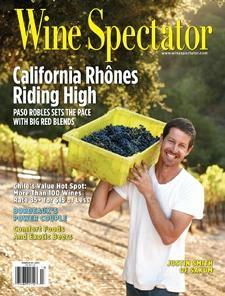 WINE COUNTRY TRAVEL-CENTRAL COAST Has this month's cover story gotten you excited to visit Paso Robles? Check our editors' travel tips on wineries, restaurants and hotels to visit throughout the Central Coast's key regions: Santa Barbara, San Luis Obispo (Edna Valley and Arroyo Grande), Paso Robles and Monterey (Santa Lucia Highlands). VALENTINE'S DAY Sweeten the day with our sure-to-please wine and food matches. Plus, dessert recipes, chocolate recommendations and more. Argentina Primer: The Andes Mountains define the country's wine regions, making for diverse styles of Malbec and Torrontès. Learn the basics as vintner Alberto Arizu joins Gloria Maroti Frazee. Oregon's Classic 2008 Pinots: Harvey Steiman presents some of his favorite Pinot Noirs from Oregon's classic 2008 vintage at the 2010 Wine Experience. Hear from the vintners behind the wines like Pas de Nom's Lynn Penner-Ash, Savoya Vineyard's Ken Wright, Bergström's Josh Bergström and Archery Summit's Anna Matzinger. WINE RATINGS+ Use our Wine Ratings Search to look up scores and tasting notes for more than 240,000 wines. Then discover more information about the wines that most interest you; individual wine pages display links to articles, blogs or videos about that producer. Collectible wines list auction price data, while additional tasting notes are displayed for older wines that we've tasted in retrospectives or verticals. VINTAGE CHARTS Misplaced your wallet-sized vintage chart from the Jan.-Feb. issue? Want extra copies? Print more with our online PDF. Plus, check out our detailed individual charts and our vintage chart grid comparing quality across all regions for the past few decades.